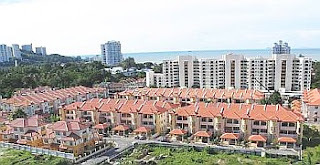 The most expensive landed residential properties on the Penang island today are located in Tanjung Bungah, Tanjung Tokong and Batu Ferringhi in the North-East district, and Sungai Ara in the South-West district. These properties are three-storey terraced, three-storey semi-detached and three-storey bungalows, which are priced between RM800,000 and RM3mil. The builders are reputable developers from Kuala Lumpur and Penang. He told StarBiz that due to high land cost and rising building material prices, it was no longer profitable for developers to build double-storey houses. “About two years ago, developers here started to build three-storey homes with larger built-up areas and higher selling prices. “Presently in the market, the selling price for a three-storey terraced starts from about RM800,000, while for a three-storey semi-detached house ranges from RM1.3mil to RM1.8mil, depending on the size. “The three-storey bungalow unit is priced between RM1.8mil and RM3mil,” he said. In Tanjung Bungah, Chong Co Group, a reputable developer with good track record, is developing the Hill View Garden, comprising about 200 units of three-storey terraced and three-storey semi-detached houses on a 20-acre site. “These properties, priced between RM800,000 and RM1.8mil, are over 80% sold. “They are selling well because of their large built-up areas that can cater to the needs of families living with their grandparents,” Teoh said. The Hill View Garden three-storey homes have built-up areas ranging from 3,300 to 5,000 sq ft, depending on the type that come with four to five bedrooms, and porches large enough to accommodate three cars. In Batu Ferringhi, similar types of three-storey landed residential properties were being developed, said Teoh. “Blossom Time Sdn Bhd is launching in mid-2008 some 129 units of three-storey landed residential properties comprising semi-detached and bungalow homes, which are part of a RM400mil development called Ferringhi Park. “Again, the emphasis is on the large built-up areas of the units, which come with five to seven rooms, depending on whether it is a semi-detached or a bungalow unit. “The semi-detached units are priced at RM1.2mil, and the bungalows at RM1.8mil,” he said. The semi-detached units have built-up areas of 3,995sq ft, while the bungalows 4,300sq ft.